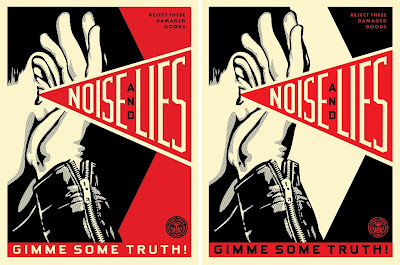 Noise & Lies by Shepard Fairey is an 18”x24” screen print on Speckletone paper. It will be available in a Red Edition and a Cream Edition, each limited to 325 pieces and retailing for $50. The Red Edition will go on sale at a random time between 10-11am PST on Tuesday, January 30th, at the Obey Giant online store, while the Cream Edition will go on tonight at a random time between 5-6pm PST. A portion of all proceeds from the sale of these two prints will benefit Media Matters to support the work they do holding media outlets accountable for untruthful and distorted stories. Honest media matters!